Product #21419 | SKU 8460 | 0.0 (no ratings yet) Thanks for your rating! 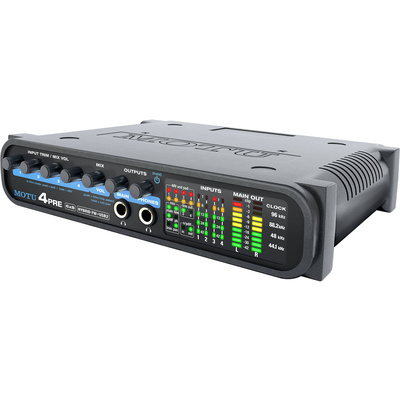 The 4pre from MOTU is a compact hybrid digital audio interface that features both FireWire and USB 2.0 connectivity. The interface can also function as a standalone mixer without the need for a computer. Four individual microphones or two stereo pairs can be recorded via the combo microphone/guitar inputs. Four analog outputs allow for connecting powered studio monitors to the main outs, while separate line outs can be used for a variety of purposes, either mirroring the main outs, or acting as a completely independent output pair. Two headphone jacks facilitate working with others. Digital input/output make digital transfers easy with support for sample rates of up to 96kHz. Digitally controlled analog trim deliver analog quality with digital precision with the ability to save and recall trim settings. The S/PDIF digital inputs can also be trimmed. Immediate volume adjustments are always within reach, so the interface serves as the perfect compact, portable live mixer, with or without a computer. The included CueMix software delivers on-screen mixing and control and can be operated side by side with any host audio software for Mac or Windows. It can also be controlled from the Mackie Control Universal Pro work surface, or any HUI-compatible controller. Additionally it provides talkback and listen back features, along with a range of software analysis tools. The 4pre can be daisy chained to another pre or MOTU audio interface. Direct SMPTE time code sync is supported without the need for a separate synchronizer. The included SMPTE Console software (for Mac OS X and Windows) provides a complete set of tools to generate SMPTE for striping, regenerating or slaving other devices to the computer.